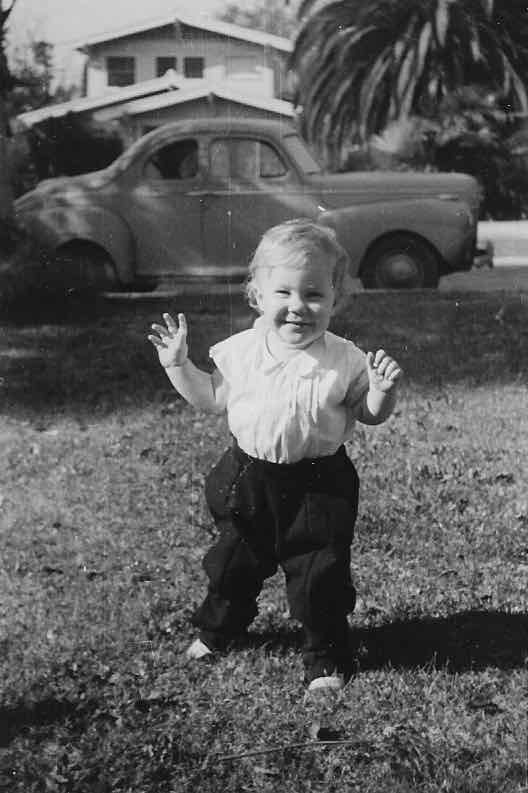 My first steps, three-quarters of a century ago. Every toddler starts out walking like an old drunken sailor, but once she gets the hang of it, there's no stopping her. I've been thinking about how much our world has changed since I was a baby, and this picture illustrates it perfectly. That old Studebaker in the background is probably not even available in antique auctions, and the cute little toddler is now certifiably old. I believe my daddy took this picture of me, since he was the only one in the family with a camera of any kind. I was fortunate to be the oldest in a family of six children, because there are plenty of pictures of me. I wonder if it was because of me that Daddy became a photographer, with a darkroom and expensive camera. At the time of this picture, he would have been in his mid-twenties and home on leave during World War II. The picture looks like it was taken in southern California, where my grandmother lived. They are all gone now, my parents and every other relative from that generation. Today, my sister Norma Jean and I are the only ones to remember our parents from the 1940s and 1950s. My younger sisters and brother were born as a sort of second act by my parents. They had a long gap between the three older children and the three youngest, for no reason that any of us remember. My sister PJ, seven years younger than I, has been gone for five years next month. But Norma Jean and I are still here, and still active seniors. I'll be visiting her a little more than a week from now, and this post will be written from her home in Florida on January 20. I've been thinking about how much our world has changed since I was born. Although I cannot tell you for certain when I first flew in an airplane, I well remember one flight when we, as a family, came back from Puerto Rico when my dad was stationed at the Air Force base there. It was on a MATS (Military Air Transport Service) plane with bucket seats on the sides, and our luggage piled in the middle. Bumpy and uncomfortable, but serviceable. No flight attendants, either. Daddy was first stationed in Puerto Rico when I was not much older than the toddler pictured here. One of my earliest memories was of walking down a sandy path to a beach, Mama ahead of me on the path with my little sister, a newborn, when I suddenly became fascinated with what looked to me to be a huge crab, scuttling sideways in front of me, claws clacking and eyestalks waving. I wasn't afraid, really, until I realized that I could no longer see Mama in front of me, and I wailed in fright until she came to find me. Memory is so funny, isn't it? Because I was afraid, the mental picture of that crab with the warm sand under my bare feet is burned into my brain, bright and real, even today. And while so much time has passed, and so much forgotten, that memory is still there. Looking back, it seems that most of the memories I carry from the past are all momentous in one way or another. I remember the birth of my two sons, their deaths, Mama and Daddy when they died (I was there for both), and the skydiving accident I endured in 2000. My recollections are sparse, considering how much time has transpired. It's normal, I guess. I'm just grateful that my mind seems to be functioning normally, and that I actually can remember those times. I wonder sometimes about young people these days. So much of their time seems to be spent in front of electronic devices and not outdoors, or not actually engaging in reality, that their childhood memories will be very different from my own. I suppose it's the same throughout generations, and although I spend time on my own devices, it's different for me. I wasn't born with a tablet or smartphone to take my attention away from the natural world. We didn't even have a TV until I was nearly ten. I remember the blurry black-and-white scenes that barely simulated reality, and how thrilled we were to see them. What a different world it is today: I am sitting here with a portable computer in my lap, connected to the entire world of information at my fingertips. My social circle includes people from around the globe who will be able to read this post immediately after I publish it. It doesn't seem that long ago that telephones were connected to the wall, that we had a party line and shared our telephone connection with other local people, and that you had to dial a number with a rotary phone. There are adults today who have never seen one. It occurred to me yesterday that there are grownup people who were born in this century and not in the twentieth century. How quickly time passes, eh? It's already 2019! Remember Y2K? It's becoming ancient history. I retired from my job in 2008 and we moved here, to Bellingham, in the springtime of that year. Most of the life I lived in Boulder seems like a dream I made up, and this place here, with the dear friends I've made, are my reality now. Sometimes I miss certain people or events, but not often. My life is here, and I keep in touch with past friends via social media and these blogs. My life is full and varied, and I cannot complain about much of anything. We have a wonderful bus system here, and now that I am over 75, I ride everywhere for free. I like to tell the bus driver that I've got a golden ticket (a gold pass) if they don't recognize me already. Most of them do, and although I still drive almost every day, I wouldn't have to if I didn't want to, or couldn't. So life is good, these first days into a new year. I frankly didn't ever think I'd see 2020, but now it's right around the corner and I'm hopeful that I'll make it. Anything can happen at any time, and I don't live a sheltered life, so who knows? But as I said, I'm hopeful. If all goes well, you'll still be reading this Sunday posts next year. My tea is finished, with my beloved still sleeping next to me. My post for this bright and beautiful Sunday is done, and I'm beginning to feel the pull to the coffee shop, to join my friends there. So, dear readers, please remember to give thanks for today and if you can, hug your loved ones. If they have moved into the Great Beyond, you can still send them your love, which is boundless. Be well until next week. It's odd how some memories etch themselves into our minds. I have thought about how the most vivid memories seem to most often recall times of great stress or great joy, although for me as an insecure child, they also recall times when I was just content. We are getting a late start around here this morning. We listened to the wind howl and blast the house from 1:45 to 3:15 last night. Looks like we have lots of yard clean up to do again now. Tom has been dealing with computer issues on our desk top. No fun. It might be time to upgrade. Oh oh, this might be a scam. I am fascinated by the memories I retain. And yes, strong emotion seems to be the key. I am also fascinated by what triggers them. Scent often for me. Enjoy your week in this ever changing world - to the max. Memories are precious things, more precious as time goes on. And although we've had some difficult times (hasn't everyone), almost all of my memories are good. And it is definitely interesting as to what 'triggers' them. I find it also interesting how we seem to become more sentimental as we age... or perhaps we always were, but now can no longer conceal it well. What a beautiful baby you were! Thank you for these words this morning; particularly these "If they have moved into the Great Beyond, you can still send them your love, which is boundless." My friend, who died last year, has been on my mind quite a bit today for some reason. And those words touched my heart today. As always a very thoughtful look at life passing by. You keep touching on one of my favorite topics...memory. We have triggers that bring back certain things. If my epilepsy is not controlled I do not make new memories. I have all the old memories but not the memories from that time during the seizure. Seizures seem to go a little in and out for up to an hour and a half with me. Onward, DJan. Your thoughtful Sunday posts are a delight! So true that the memories that seem to be seared forever deep within us are emotionally charged by fear, joy, pain, excitement, awe, sorrow... I love my peaceful calm days but I may not remember much of them over time. Cute photo. Interesting memory of the crab and feeling lost from your mother. It is funny how some moments you can remember from a very early age when it is linked to fear or pain. I was bitten in my arm by a dog when I was 2 years old and I can still remember that hallway where the dog was lying and I wanted to pet him. The accident of the bite I can't remember, but the followup that I was sitting in front of the bike of my father returning from the doctor we had consulted and me holding a little doll he had bought for me. That photo is precious. Imagine what adventures awaited that precious little girl. Such promise too. The sorrows and joys give our lives flavour. Nothing bland there, Jan. I hope you enjoy the visit with your sister as always! You haven't changed a bit:) Well a bit taller, wiser and way smarter. Like you I can remember details from long ago quite clearly. I think today's youth will be able to access their social media accounts in the future to visit memories. I kind of like our way better but who's to judge? That looks just like you! So funny how some babies never change and others, like me, are unrecognizable matches between childhood and adulthood. Yes, I grew up outside too, although I did spend a lot of time in front of TV. So much so that I dream in black and white. I read that there is a small slice of boomers who spent childhood in the years after most folks had a TV and before everything was in color. It is not uncommon for this small slice to dream in black and white. Proof for sure that our screen time influences our minds!!! Happy New Year. I look forward to another year of your wonderful posts. I am thankful for each moment....each day. You are among the reasons I am thankful. Unusual to say that...seeing that we have never met. But here you are. The first time I read your blog, I became your friend without your knowing it. You are an amazing lady...and I saw that when I read the words from your heart to your blog...to your friends. Enjoy the visit to Florida with Norma Jean. Continue making those memories that make you "You." I love the photo of you as a toddler. How happy you were! My older sister was the one with the camera in our home. We have so many pictures made by June back in the early fifties. Just read in an old diary of mine that our family got our first TV when I was twelve or thirteen. How excited I was to see Elvis Pressley on the Ed Sullivan Show. Like you I seem to be constantly reminded of how many people in my life have died in recent years. I talked with an old friend today and the first ten minutes I heard about so many people we both knew who have died. Gets depressing. But we have a new year to enjoy now and I am scheduling classes to teach in April, May and June. 2019 is my year to make a difference and after this year, I might just stop trying.